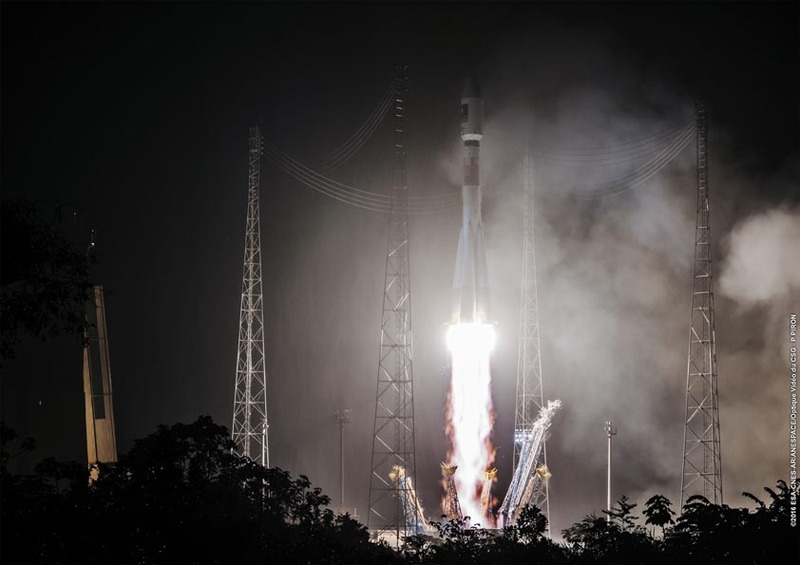 The European GNSS program added two more spacecraft to its constellation this morning (May 24, 2016) with the launch of Galileo satellites 13 and 14. They lifted off together at 08:48 GMT (10:48 CEST, 05:48 local time) atop a Soyuz rocket from French Guiana. This seventh Galileo launch went by the book: the first three Soyuz stages placed the satellites safely into low orbit, after which their Fregat upper stage hauled them the rest of the way into their target medium-altitude orbit in plane A, slots 2 and 6. The twin Galileos were deployed into orbit close to 23,522 kilometers of altitude, at three hours and 48 minutes after liftoff. The coming days will see a careful sequence of orbital fine-tuning to bring them to their final working orbit, followed by a testing phase so that they can join the working constellation later this year. “Today’s launch brings Europe’s Galileo constellation halfway to completion, in terms of numbers,” remarked Paul Verhoef, ESA’s Director of the Galileo Program and Navigation-related Activities. “We are now at cruising speed as far as deployment is concerned. This was Galileo’s last flight by Soyuz this year before the first launch using a customized Ariane 5 that will carry four rather than two satellites each time — which is set to occur on November 17. The modified Ariane 5 is designed to dispense one satellite into each of four orbital planes, Verhoef said at a prelaunch teleconference on Monday. The Galileo program plans to launch four more satellites in each of the next two years. Work has not yet been completed on the Ariane 5 customization. The testing of the dispenser and qualification of the launcher is “ongoing,” according to the ESA officials. The rocket needed structural modifications that can support the long trajectory into middle earth orbit and accommodate three different configurations of spacecraft in the dispenser that releases them from the launcher. Progress with the program has given its managers confidence that they will be able to announce the availability of “initial” Galileo services in October, following a security clearance expected early that month. Those will include the Open Service civil signal, a search and rescue service, and the encrypted Public Regulated Service (PRS). At its June 7 meeting, the European Council of Ministers will take up requests from Norway and the United States for access to the PRS. Meanwhile, efforts continue to complete upgrades to the widely scattered ground segment, including the security monitoring station and another monitoring station in Tahiti, Verhoef said. An invitation to tender (ITT) went out to industry in the last couple of weeks for the third batch of eight satellites with an option for six more.